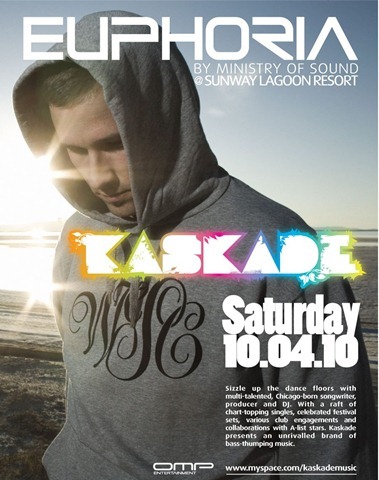 Ryan Raddon or better known as DJ Kaskade, will be spinning his Trance tunes in Malaysia's Euphoria by Ministry of Sound, Sunway. The date: April 10, 2010, a Saturday night! The one originated from Chicago is currently ranked number 51 in the 2009 DJMags top 100 DJs. my favorite track from Kaskade is Angel On My Shoulder which had Tamra on vocals.